A puffin skin parka. An Alutiiq whaling lance. A can of salmon from Klawock. 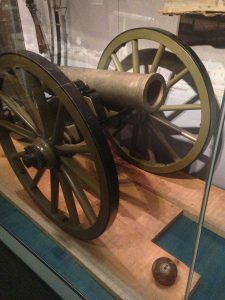 A mountain howitzer and artillery shell. These are not the kind of artifacts that immediately bring to mind the Treaty of Cession, like William Seward’s cape or Emanuel Leutze’s iconic painting, Purchase of Alaska, might, for example. Nonetheless, as I started researching and producing Alaska Out of the Vault, a podcast that examines Alaska in the decades around the Treaty of Cession, I was more interested in discussing what was occurring in Alaska— not in Washington, DC— and what themes and transitions were afoot rather than the big, iconic moments on which we tend to focus our attention (ahem, Alaska Day). While there are countless compelling objects and stories that relate truths about Alaska in the 1800s, I selected these objects based on the broad, and hopefully unexpected, stories that they communicate. The mountain howitzer became a medium for the story of the US Army in Alaska in 1868-1870 and the transitions that occurred both at Fort Kenay (sic), the Dena’ina village of Shk’ituk’t, and within the lives of Vladimir and Evgenia Stafeef (alternate spellings abound), an Estonian employed by the Russian-American Company and his Dena’ina wife. When the US purchased Alaska, the nation was amidst Reconstruction. It was determined that Alaska would be managed as a military district until Congress created legislation for local civil government (which took another seventeen years, by the way). Alaska became part of the Military Division of the Pacific, and Army units were sent to Kenai, Kodiak, the Pribilofs, Wrangell, Sitka and Tongass to open posts. But Battery F didn’t make it to the old Russian trading post called Nicholas Redoubt when or how they intended. While sailing near Port Graham the Torrent hit a reef, sending the ship down and the crew, soldiers, and their families to the beach. They salvaged three of the four mountain howitzers with which they traveled before being rescued and spending the winter in Kodiak. The next year, 1869, they made it to the trading post, which was about a mile from the Dena’ina village of Shk’ituk’t, according to anthropologist Dr. Alan Boraas. For this episode, I spoke with Dr. Boraas about Dena’ina interactions with Russian fur traders and the US Army troops. Moreover, several primary sources from Fort Kenay are shared, including one that details when the American yard was adopted as the standard unit for trade, and an evocative letter from Vladimir Stafeef, in which he recounts his indecision about paths forward in the new American Alaska. Finally, retired state archaeologist Dave McMahan recounts the 2008 recovery of materials from the Torrent shipwreck, including the mountain howitzer on exhibit at the Alaska State Museum. The Alutiiq whaling lance with Cyrillic letters is a lens to consider a relatively unknown Alaska Native whaling tradition and to explore how Alutiiq, Yankee, and Russian whalers interacted with one another and the so-called Kodiak Grounds, which corresponds to the Gulf of Alaska, in the 19th century. In an interview with archaeologist Patrick Saltonstall, we discuss the archaeology and history of the Alutiiq whaling tradition. In the late prehistoric period through the late 19th century, Alutiiq whalers were shamans. They used talisman, magical practices, and mummy fat mixed with monkshood and then smeared on slate lances to execute the hunt. Examples of these lances are exhibited at the Alaska State Museum, Baranov Museum, and Alutiiq Museum. With historian Ryan Jones, we learn how whales were central to the economy of Russian America and Russian-American Company control of Alutiiq labor. Whalers had to give ½ of every whale to the company, which then distributed the materials and meat to outposts and hunting camps. Jones describes how the incursion of Yankee whalers impacted Native whaling and belatedly inspired the Russian Empire to finance its own commercial whaling venture. The Russian-Finnish Whaling Company was mostly a failure, and the tense relations among American whalers, Russian officials, and Native villages did not presage the diplomacy of the Treaty of Cession. Regardless, Americans came to use Alaska’s natural resources on a large scale for perhaps the first time, as whale oil lit cities and lubricated gears in New England. 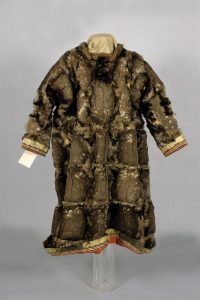 Unangan puffin skin parka, circa 1880s. Photo courtesy of Alaska State Museum. A puffin skin parka with elaborately embroidered hems and cuffs elucidates the work of Alutiiq and Unangan women in Russian America. This parka, also exhibited at the Alaska State Museum, was collected by the surgeon of the USS Resaca, a Navy ship sent to Alaskan waters while the crew convalesced from an outbreak of yellow fever. Coincidentally, the vessel arrived in Sitka in time for the transfer ceremony, where it stayed until January of 1868. In this episode, I not only examine possible ways that an Alutiiq or Unangan garment made its way to Sitka, but what the puffin parka says about the internal economy of Russian America. Russians were dependent on the labor and goods of the Alutiiq and Unangan to produce sea otter pelts for international markets and to feed, clothe, and pay those incorporated within the Russian American colonies. The work of women was central to this. Elderly, infirm, and adolescent men were sent to puffin rookeries to snare a company-established quota of birds. Women then prepared and sewed the skins into parkas, which were used as a form of currency by the Russian-American Company. For this episode, I spoke with Alaska State Museum conservator Ellen Carrlee about the difficulties in attributing the origin of this parka, historian Katherine Arndt about the use of Alutiiq and Unangan labor in Russian America, and Alutiiq skin sewer Susie Malutin about the Alutiiq skin sewing tradition. The show ends in Sitka, with a triumphant news report about the US purchase, although it is quite clear that these American newcomers had little idea about the complex and tragic economic system that they were eager to supplant. Finally, through a can of Klawack (sic) Brand salmon, we learn of the dramatic transitions within Southeast Alaska spurred by the industrialization of Alaska’s salmon industry, and how Senator Charles Sumner’s vision for Alaska’s maritime resources came true. 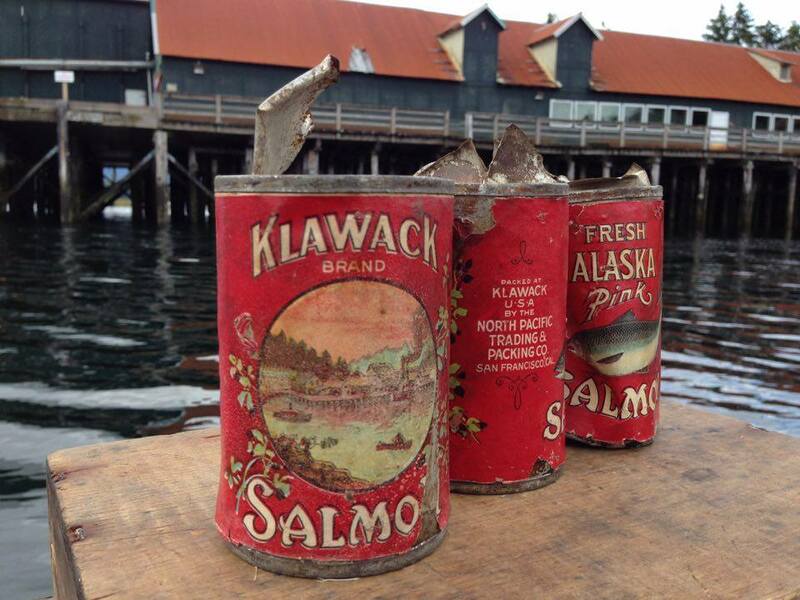 In 1878, the North Pacific Trading and Packing Co processed the first can of salmon in Alaska in Klawock, on Prince of Wales Island. Previously, the site of the cannery was known as Hamilton’s Fishery, named after Scottish proprietor George Hamilton, who had come to Southeast Alaska in the years immediately following the US purchase and married a Haida woman. 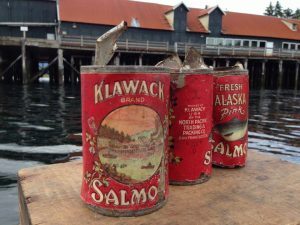 In this episode, we hear from Fred Hamilton, the 96 year old grandson of the founder of Alaska’s first cannery. We learn about the sophisticated methods that Tlingit people employed to harvest salmon and manage salmon rivers from anthropologists Dr. Steve Langdon. Dr. Langdon’s research shows that Tlingit management of the Klawock fishery persisted for a time following its commercialization. From Dr. Dennis Demmert, we learn how life changed for the Tlingit of Prince of Wales Island when the cash economy began to pervade the area. We also hear the words of Senator Charles Sumner, who advocated for the Alaska Purchase and pointed to Alaska’s marine resources as a great boon for the nation. Over these four episodes, then, we learn of how Alaska Natives were impacted by the Russian-American Company, how the transition to American military rule played out on the ground, and how American businesses and capitalism transformed lives and cultures. Please listen, and if you like what you hear, please share with your friends and colleagues. You can listen to the podcast at my website, www.anjuligrantham.com/alaskaoutofthevault, or find Alaska Out of the Vault wherever you listen to podcasts. I would like to thank the Alaska Historical Commission, Alaska Office of History and Archaeology, Kodiak Public Broadcasting and the Division of Libraries, Archives and Museums for their support of this podcast, in addition to the many whom I interviewed and helped with my research.